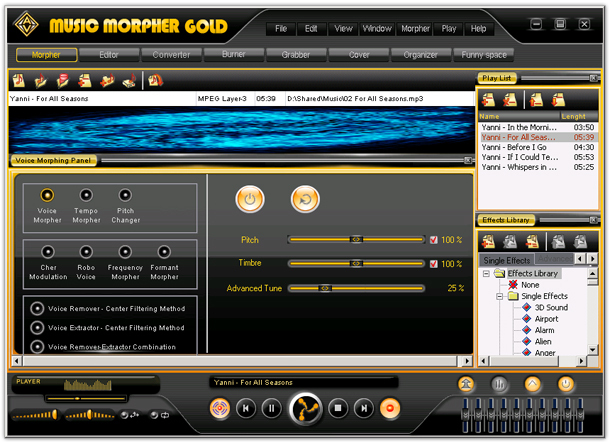 Free Download AV Music Morpher Gold 5.0.58 - Morph, mix, record your music like a real DJ. AV Music Morpher Gold is a versatile tool that will thrill a DJ and entertain a home user. The software comes with all features a DJ needs: audio editing (copying, cutting, pasting sample fragments), voice extractor/remover, an mp3 recorder and player, an effect library, a morphing tool. The morphing algorithms can be run in real time, so that you can listen to music and morph it on the fly. The morphing options include voice and tempo change, adding beats, applying effects. The morphing settings can be then saved into a file. The available effect library offers a variety of options for a creative DJ. Make use of the voice extractor/remover to separate the singer voice from the audio file. It'll give you more room for remixing and medleying melodies. You can also remove voice to create a karaoke file. The software is compatible with karaoke players and plug-ins. Apart from the built-in mp3 recorder and player, AV Music Morpher Gold incorporates an mp3 converter supporting audio file conversion to 10 formats, including wav, wma, ape, ogg. The CD ripper and CD burner components make AV Music Morpher Gold a powerful tool for creating complete DJ productions - from audio track ripping to remixing and recording the final result to a CD. The built-in CD cover editor for inlay, label and cover design creation makes the work accomplished. Great! Now I can create many funny ringtones. I used the trial version for about 10 days and decided to spend the $99.95 for the full version. Almost all of my software is freeware but I am very pleased to have made the decision to buy this. Review AV Music Morpher Gold!